No, we didn't break the switch (really). This is actually a rocker switch, hence the "push ON" label. This switch, as observant readers might guess, is the elevator's main line. 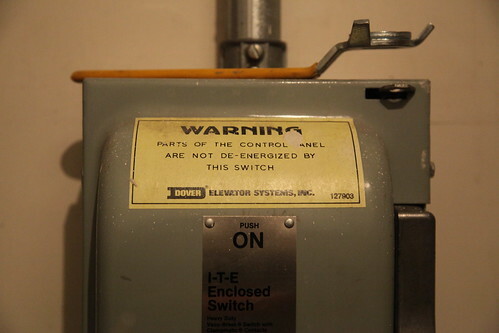 It does, after all, clearly read, "Dover Elevator Systems Inc." It also reads, "Warning, parts of the control panel are not de-energized by this switch." Emergency lighting and other critical life safety systems are not de-energized merely because the switch is thrown. Anyway, as for where the switch handle came from... fucked if I know!